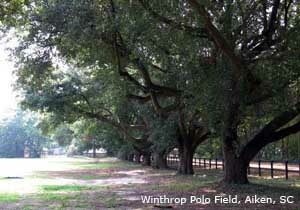 The Aiken Land Conservancy (ALC), formerly the Aiken County Open Land Trust (ACOLT), is a private, non-profit organization dedicated to the preservation of open, undeveloped space in Aiken County, South Carolina. ALC is one of twenty six (26) land trusts within South Carolina and one of over 1,000 land trusts nationwide. Currently, ALC has preserved thousands of acres of land throughout Aiken County. These tracts of land include rolling meadows, towering pines, and shady hardwoods with azaleas and kalmia blooming underneath, wetlands, stream banks, and prime habitat for deer, turkey, and other wildlife. Our mission is to preserve open land for the benefit and enjoyment of the public, to preserve the character of Aiken County and surrounding counties, including agricultural and forest lands, lands of educational and historic value, fragile ecological sites, watersheds, and visual amenities, to foster the use of sound conservation practices, and encourage land use planning to the long-term benefit of the citizens of the region we serve. ALC preserves land through land donations and conservation easements from landowners. ALC directly owns approximately 640 acres, which have been donated by landowners dedicated to the preservation of open space. The rest of the acreage we protect has come from conservation easements donated by land owners. In addition to protecting the environment, both outright donations of land and conservation easements can offer significant state and federal income tax benefits. Structured properly, these types of donations can reduce property taxes and estate taxes. Like a significant number of other land trusts, ALC is primarily a volunteer organization with two part-time staff members. Our operating funds come directly from our memberships. Our active board of directors and several volunteer committees negotiate for land, build and preserve trails, monitor conservation easements, lead field trips, and organize seminars. ALC also shares information about its activities with members and friends through our newsletter. There is always plenty of work to be done, so we welcome volunteer help! Open space in Aiken County is disappearing rapidly, so please help us preserve your favorite places. ALC is looking for volunteers. If you would like to help us preserve Aiken’s special places, email us at mail@conservaiken.org.